"This is a cake that can be served anytime." Grease and flour bottoms of three 9 inch layer pans. Preheat oven to 350 degrees F (175 degrees C). Melt 1/4 cup butter in heavy skillet over medium heat. Add pecans and brown 10 to 15 minutes, stirring frequently. Sift flour with baking powder and 1/2 teaspoon salt. Cream remaining butter in large mixing bowl. Gradually add 2 cups sugar; cream at high speed of mixer until light and fluffy. At medium speed blend in eggs, one at a time, beating well after each. At low speed add sifted dry ingredients alternately with milk and vanilla extract, beginning and ending with dry ingredients. Blend well after each addition. Stir in 1 1/3 cups pecans. Pour batter into pans. Bake for 25 to 30 minutes, until cake is golden brown and springs back when lightly touched in center. When cool, blend remaining pecans with Creamy Butter Frosting; spread between layers and on top. To Make Creamy Butter Frosting: Cream 1/4 cup butter or margarine in mixing bowl. Add 1 teaspoon vanilla extract, salt, 4 cups confectioners' sugar and 1/3 to 1/2 cup cream. Beat until smooth and of spreading consistency. If necessary, thin with additional cream. Has a wonderful flavor but, cake came out VERY dry, I will try making this again but I will be adding oil to recipe. Will let you know. I tried this cake and it was absolutely fantastic. 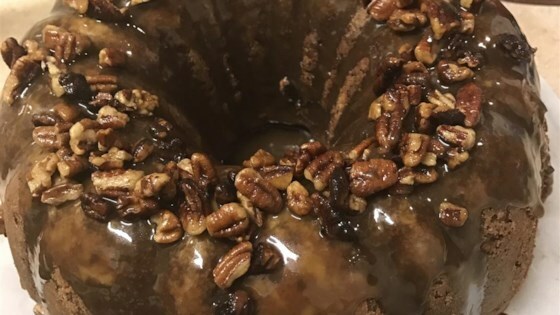 The cake has the flavor of my favorite ice cream, Buttered pecan. I got rave reviews from my family when I made this cake for my mom's birthday. This is one of those cakes that can really be addictive. I probably make it once a month at least.